When you're hard of hearing, most phone systems are too quiet to be able to use for long periods without disturbing your family and neighbours. Thankfully, the Geemarc Amplidect 295 Combi Photo Amplified Corded and Cordless Phone Combination with Answering Machine is an excellent solution. 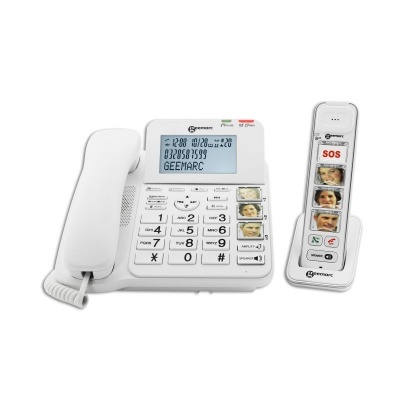 The system combines both a cordless phone and a corded phone with integrated answering machine, allowing you to use a phone easily. These phones are compatible with most hearing aids and allow you to adjust the receiving volume. If you find that you often feel isolated from your family and friends, this is a perfect solution for you. 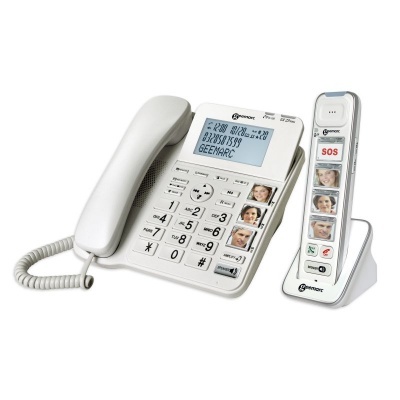 Compatible with most hearing aids that have a telecoil facility, the Geemarc Amplidect 295 Combi Photo Phone and Answering Machine is ideal if you're hard of hearing. The phones have a receiving volume of up to 30dB on the corded phone and 22dB on the cordless handset, allowing you to adjust the volume according to your needs. Not only is this product ideal if you're hard of hearing, but it's also perfect if you aren't as mobile as you once were, or if you aren't able to see as well as you once did. This is because both phones feature photo memory buttons: three with a picture display on the corded phone and four photo buttons on the cordless phone. The integrated phone book also allows you to store an additional 50 names and numbers, meaning you're able to contact your friends and family with just a few presses of a button! As a Cordless Photo Phone is included with your purchase, this allows you to keep the phone with you at all times while you're in your home. Gone are the days where you have to rush up to the stairs to answer the phone and risk an injury! If you require more than two phone around your house, you can create a system with up to four bases and up to five handsets. This is perfectly suited to you if you suffer from limited mobility or if you live in a spacious house. Help for a 92 year old woman. I bought this set for my 92 year old mother who has Macular Degeneration in both eyes and hearing problems,she is able to use them. But could do with better instructions.